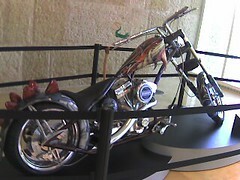 Cycle made by the ‘american chopper’ guys to honor the 20th anniversary of the Discovery channel. edited to add: nothing cool in the loo. I was expecting space-age hairspray or at the *very* least, a bidet. v. disappointed. networking dinner tonight. this has the potential to be a very boozy event.